Wait, veloviewer tile game accepts open water swims as valid for bagging tiles? There are no official rules but in general all human powered activities are accepted. You can log them as a swim with Strava. Just like a few of those tiles in your area have been done on skates in the past winter. A kayak would for example also be acceptable. A sailing vessel is stretching the limits of the rules. I wondered when a thread on this would pop up. I heard about this following Graeme's write up about his ride with Deano. It's great because I already try to find new roads when planning DIYs by GPS. I'm just on 9x9 so far. I think 27x27 is possible eventually (with some walking), but then I'm stuck between the Severn and Salisbury plain. A "run", which you can do at walking pace, will also suffice. No need to get wet unless the entire square is water. 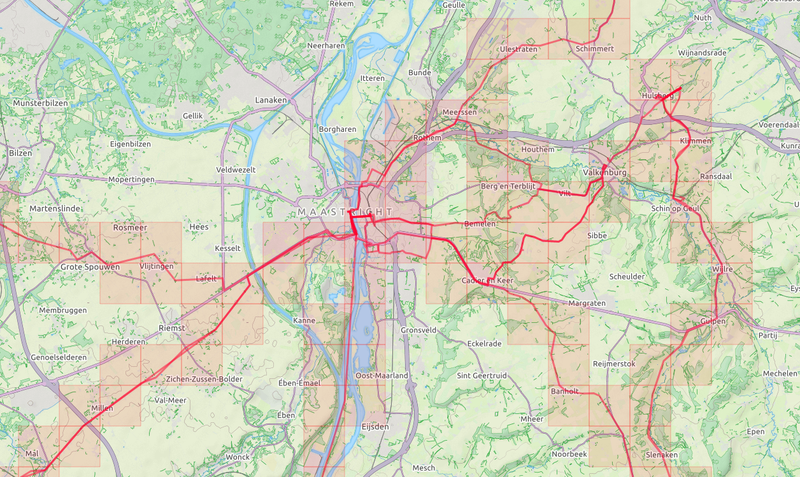 You've done your map in one year, mine is the result of 10 years of cycling with a GPS. "That was a nice ride, all of it apart from why the hell did we go down that one way road at the 165km mark?" "I was missing a tile..."
I have been trying to ignore this because I know what will happen. It's addictive. I just did a 77km jaunt North of the canal, to get me upto 2 different 9x9 squares. One tile is likely to prove very hard to get as it turns out its on a nature reserve closed to humans. Couple more tiles should give me a big bump in square size. * one algorithm that would give me the a route of the least number of contiguous squares (starting and ending at my home square) to extend my max square to n*n.
* a similar version that would start at home but end at any number of designated finish squares which correspond to train stations that could get me home easily. * another that given a maximum number of contiguous squares would cover the most new squares possible (with those closer to home worth more than those further away). Probably something similar for cluster, although my max cluster is currently 60km North of where I live as I've done lots of different Audaxes up there. Today's ride to get my max square up to 8x8 should bring it back home. Algorithms don't give me any kind of advantage as it's simple enough to do the above manually by eye, it's just piqued my interest from a programming point of view. Unlikely to beat this for a while as I don't live there any more. Max cluster for the new house is not much different to the max square above. Unfortunately, I've only got Strava data going back to mid-2013 - although if I did it probably wouldn't do much for my square and cluster scores it would increase my total tiles by a fair amount. One tile required for 9x9 and 5 more for 10x10, but then progress will be a bit slower. Lots of scope for extension via different commuting routes too. A couple of rides between both homes and you'll have a massive leap in max cluster. Same here. 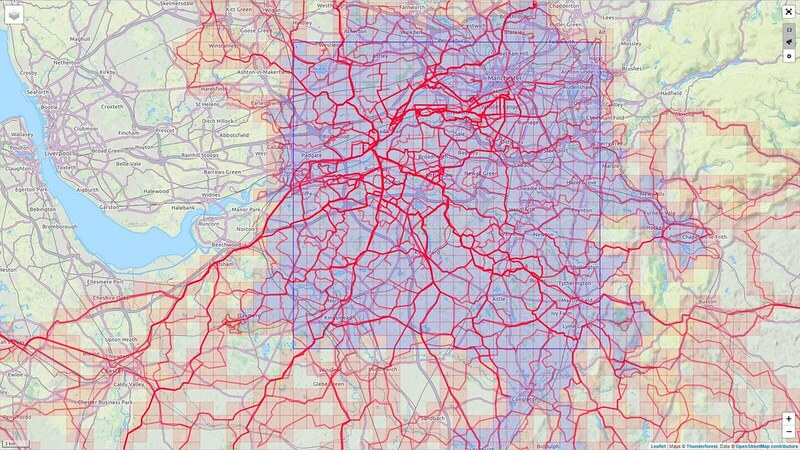 To increase the cluster and link there and here, would mean rides through... Lincolnshire. *shudder*. It really highlights what I'd known, in that there's a highway network of cycling roads that go places, and audaxes tend to use the same ones. I started Strava-ing in 2011, but until about April last year I only Strava'd rides of 'significance'. So all the pub runs, training rides and utility rides didn't feature. Part of me is tempted by a data dump. But probably not. The roads covered by pub runs and most utility rides have all been covered by 'significant' rides for me anyway, so adding them wouldn't make much difference. Saying that, I've got almost nothing in North London. What I do have is either covered by rides up to Cambridge (which go East of Liverpool St) or the London Sightseer in 2007. Despite cycling to/from Paddington, Kings Cross, Marylebone, Edgware Road, etc for lots of Audaxes I've not Strava'd a single one of those rides so those tiles remain unclaimed. Tiles within 10km or so are relatively simple to add, although yesterday's 50km bimble planned purely to cover tiles did send me down a wide variety of roads/paths/subways given that I didn't pay any attention to route planning other than 'that road goes where I want to go'. Makes a change from blatting around the park on roads I've seen hundreds of times though. Found a couple of old GPX files from rides out to drop off OU assignments right on the deadlines (any excuse for a ride!). One to Wanstead and back and one a 50km blat from work out to Sunningdale. Neither add to my scores though, but the Wanstead one did fill in a bit out in East London. IS there a quick way to see this? Nope. I've got some scripts to do it but they require me entering my squares as either . or * in a text file which takes a long time and is prone to error. Before that I took a screenshot of my current map (with tile boundaries enabled) and then added dots in MS Paint to find the numbers. Greenbank and "I've got some scripts" go together like "Peas and Carrots" or "Bacon and Eggs"